SysArc Inc. is proud to announce that it has been awarded the Comptia Security Trustmark+ due to its excellence in implementing the NIST Cybersecurity framework for DoD Contractors, Federal Agencies, and companies throughout the United States. The CompTIA Security Trustmark+ is based on the NIST Cybersecurity Framework and provides a cost-effective path for demonstrating compliance with key industry regulations such as DFARS, FISMA, PCI-DSS, SSAE-16, HIPAA, and others reliant on the NIST Framework. ISO, the International Organization for Standards, also currently maps into the NIST Cybersecurity Framework and is reflected in elements of the CompTIA Security Trustmark+. 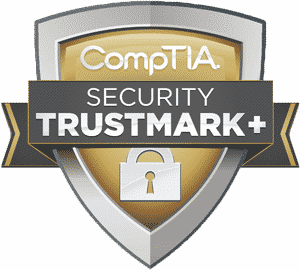 To earn the CompTIA Security Trustmark+, SysArc successfully completed an assessment of their security policies, procedures and documentation by a CompTIA-approved 3rd party reviewer. This assessment provides the organization with feedback on the quality and comprehensiveness of their security posture. Organizations at this level have earned the highest Security Trustmark available. SysArc helps organizations throughout the United States comply with government mandated cybersecurity regulations. As SysArc has previously reported, The White House, Department of Homeland Security (DHS), and Department of Defense (DoD) have put a high-priority on getting government agencies and contractors to comply with these regulations. The result has been demand for cyber security experts such as SysArc at its highest level ever. For more more information about SysArc’s Compliance Solutions and Services, please see our Services page. If you have any questions or concerns about your organization’s cybersecurity, please contact SysArc at (240) 350-9638 or fill out this online form. Learn how we can protect your company's data and help you become compliant. What is “Adequate Security” for DFARS/NIST 800-171 Compliance? Do Small DoD Contractors and Subcontractors Have to Comply with DFARS?